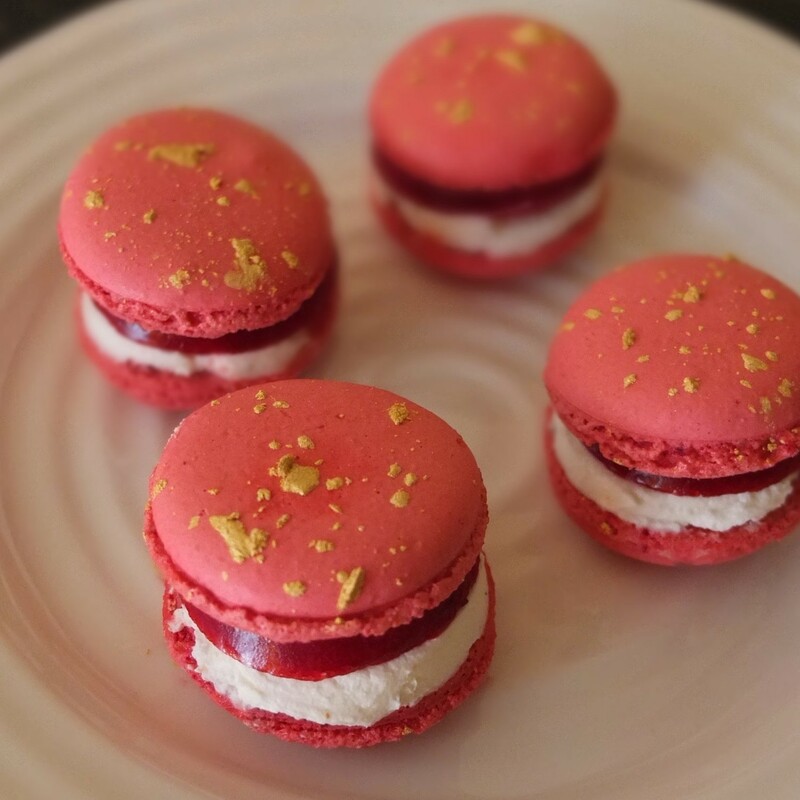 Slightly savoury raspberry and black pepper cheesecake macarons recipe! Decorated with lunar new year roosters! 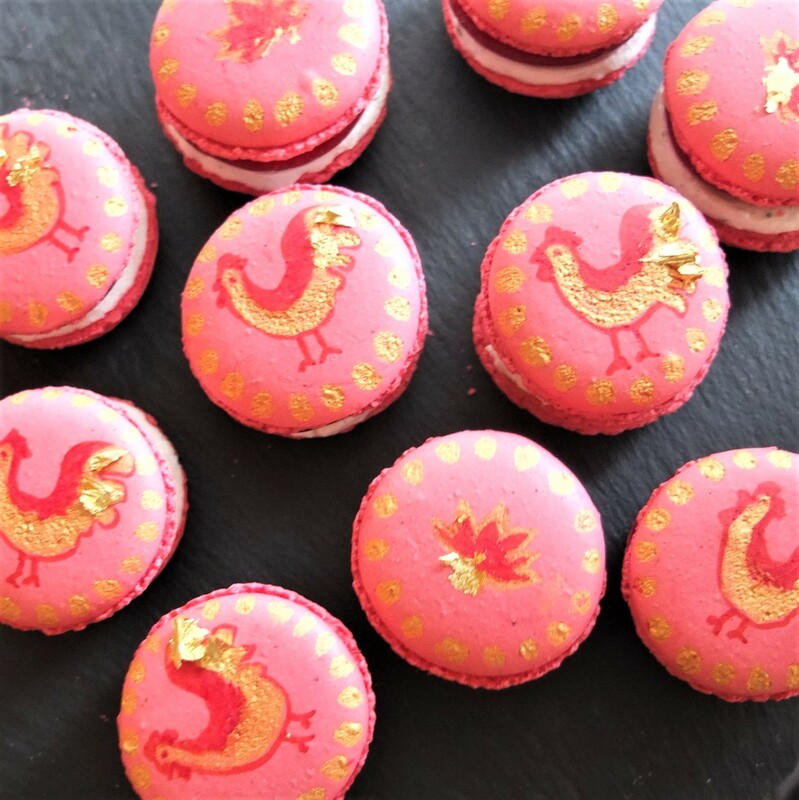 Raspberry and black pepper cheesecake macarons for a fire-rooster new year! There’s no need to paint roosters. Just have pink macaron shells to reflect the raspberry filling. Follow your own macarons recipe or use my step-by-step instructions for Italian macaron shells in the basics section – they’re very do-able! Cool completely before filling and if you prefer make the day before (store in airtight tupperware at room temperature). Optional rooster decoration: do this before filling. 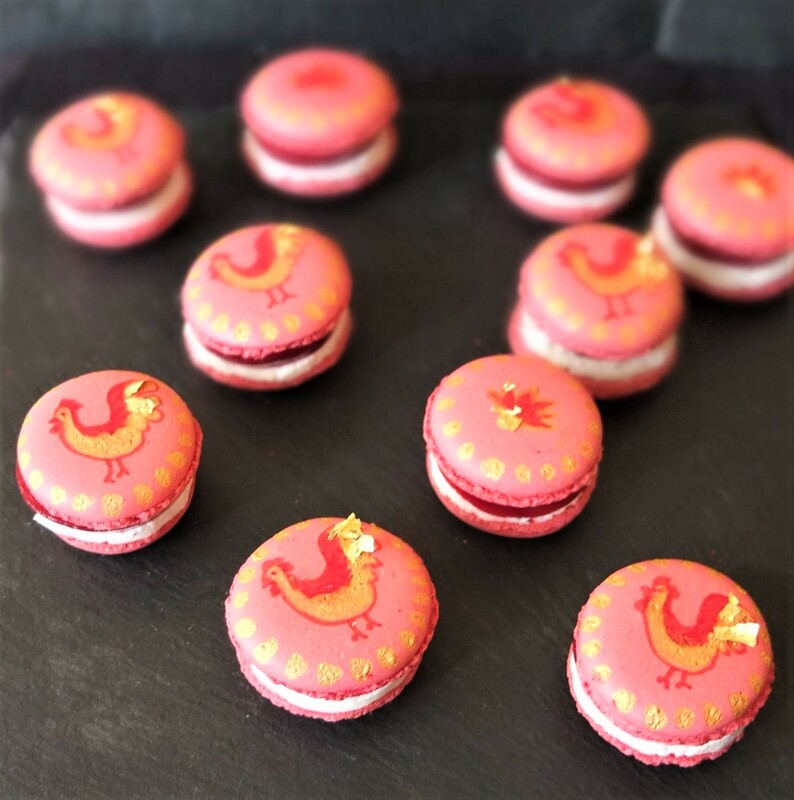 Draw the outline of the roosters with a red edible food pen. Add a little water to edible gold powder and with a thin paintbrush fill in the roosters and add dots around the edge. 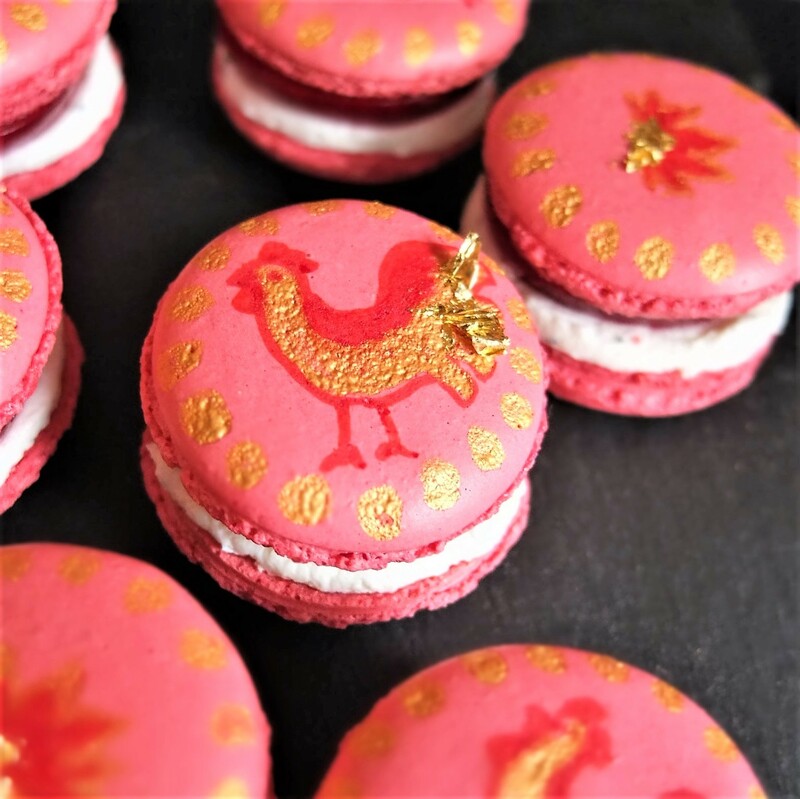 Then use tweezers to put a little edible gold paper on the tail to add height and the idea of a shimmering flame, because 2017 is a fire rooster year! You can also draw lotus flowers or anything you like! Perhaps some hearts for Valentine’s Day? These inserts can be made up to a month before and kept in the freezer wrapped in plastic film in airtight tupperware. Defrost a little before using. 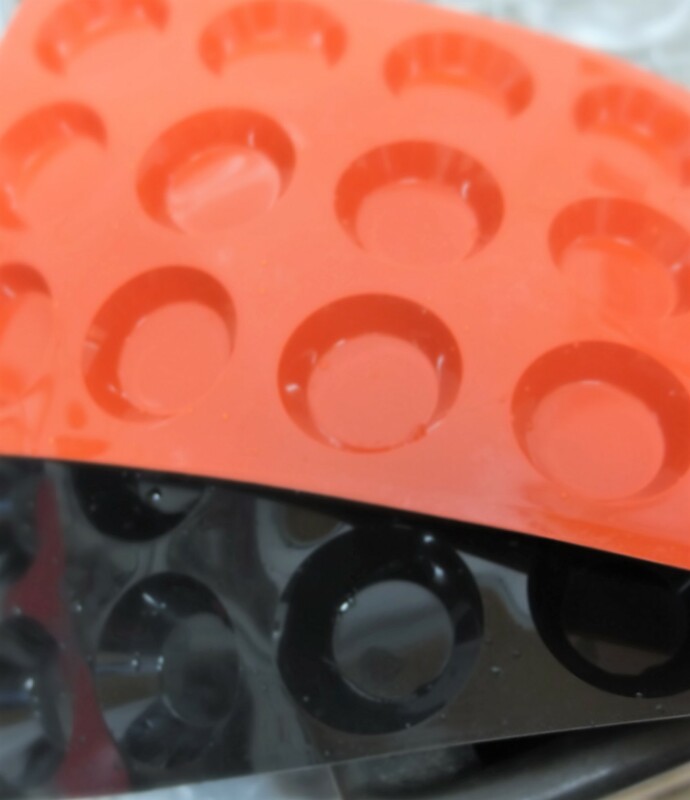 You can use shallow silicone moulds like these, filling around 2-3mm high (maybe 4mm). You need rounds about the same size or diametre as your macarons so alternatively you could use a silicone tray then cut out rounds with a cutter when the jelly’s set but not too frozen. Quantities depend on how big your macarons are and on taste (how much cream cheese you’d like in each macaron) so please adapt. Beat the cheese with the freshly-ground black pepper to combine well. Pipe a layer of cream cheese on a macaron shell. Top with a raspberry layer and the decorated shell. Smooth the filling by going around the edge with a finger. Tada! A yummy macaron! They’re a bit higher than my usual macarons so next time I could make the raspberry layer a little thinner. Another possibility is a ring of cream cheese with a small circle of raspberry jelly inside. But with these higher ones there’s a nice ratio of filling to shell, making the macarons tastier and more refreshing. Once filled store in the fridge. Keep on a tray uncovered 24 hours then store in airtight tupperware. The jelly and cream cheese make these macarons soften rapidly so you can eat them almost immediately but preferably after 1 or 2 hours. They’re best eaten the same day. The next day they’ll be tasty but softer and the jelly layer starts colouring the cream cheese. You can store the cream cheese mixture separately in the fridge, and the macaron shells and raspberry inserts in the freezer, then assemble macarons every few days. These aren’t exactly healthy (despite the raspberry juice?!). 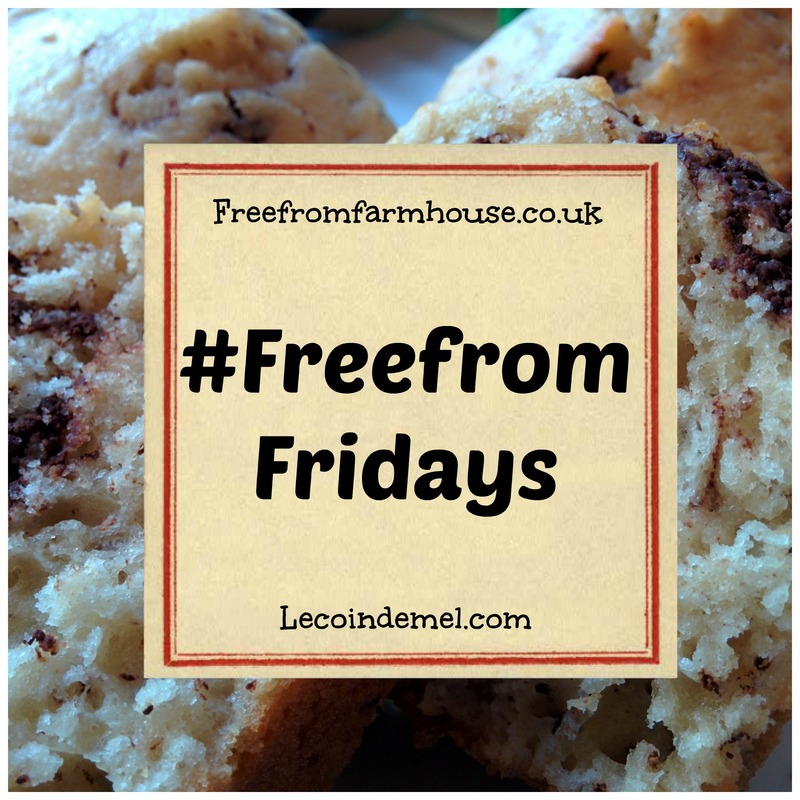 But they are gluten-free treats so I’m taking them to Free From Fridays hosted by Mel@lecoindemel and Emma@Freefromfarmhouse. 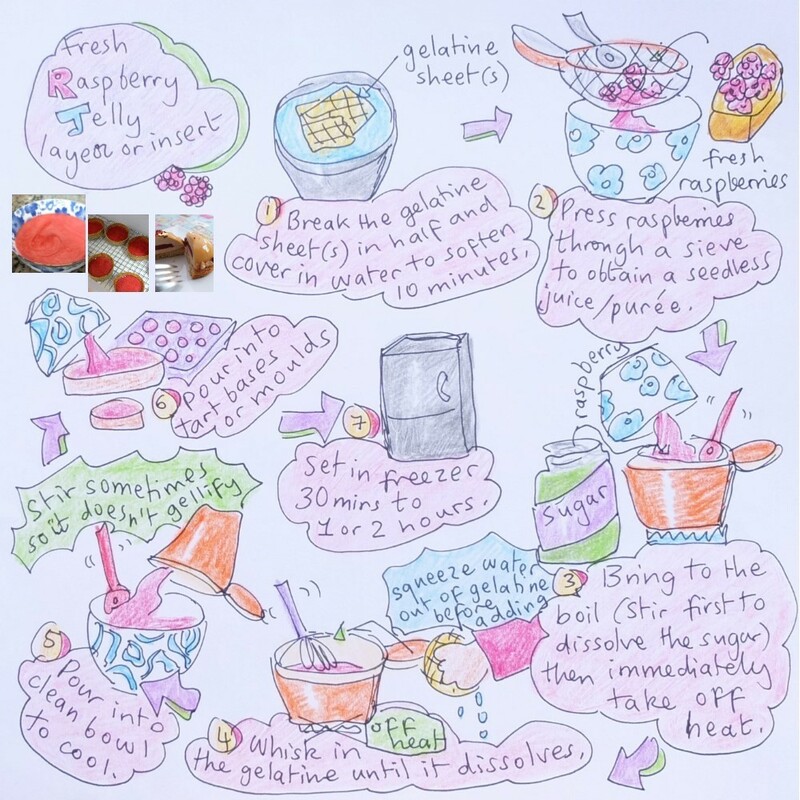 Do check out the great ‘free-from’ recipes there! 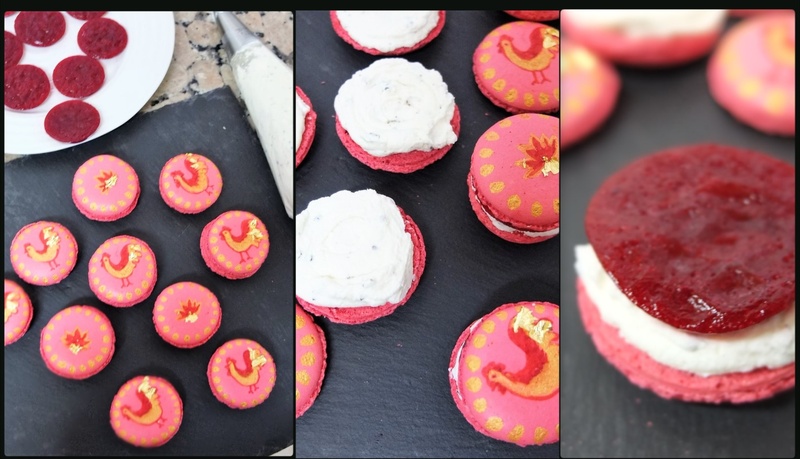 Have a raspberry and black pepper cheesecake macaron! Wow. 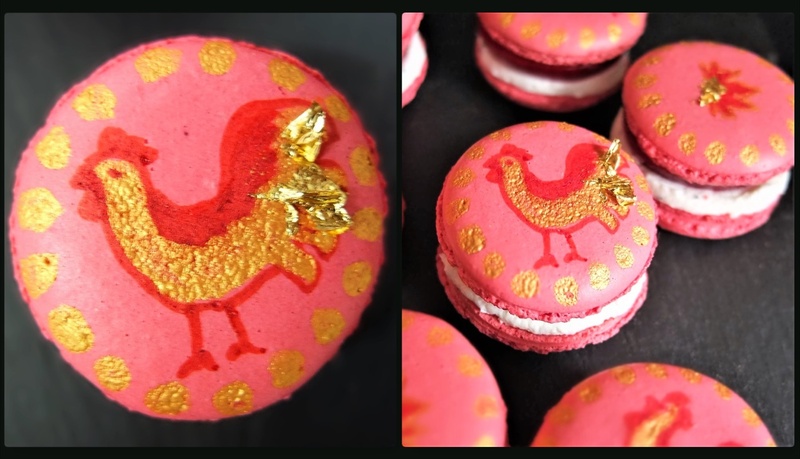 Very creative Chinese New Year touch on macarons! Great looking! How original! I never would have thought to put black pepper in macarons! Honestly, I’m not even sure I’d want to taste one before reading this, even though I love raspberry AND black pepper (just haven’t had them together before). This recipe looks great though and I’d definitely have to try it one day. And I love the Rooster design. If possible, could you please check out my blog as well? Thanks!